Super Hero Boy: Whiteout was a huge suprise! Whiteout was a huge suprise! My mom picked Whiteout out of my review pile to watch while she was down visiting here recently and I was sort of glad as honestly it was not on the top of my list of movies to review. Partially for the fact that I really knew nothing about it other than the press release I had sitting with it. Though I do love a good action flick, sometimes I feel a little burned out on them as it seems I'm always constantly surrounded by boys and all we watch is action flicks. The first few minutes of Whiteout didn't do a whole lot for me either. The scenery is well.. um.. WHITE.. seeing as it's set totally at a base in Antarctica. I mean, seriously after watching this movie I can tell you without any second doubt in my mind that Antarctica no mater how cheap the tickets would be will NEVER be on my list of places to visit. Even in the first few minutes where this insane killer is chasing the main actress and she looses a glove, makes me vote no for very very cold places. The movie and plot itself though actually is really quite good and I have to say I had a really hard time picking out the "killer" from the list of possibilities. I mean its not like people can just come and go at will anytime they like from Anartica so the choices are limited but the ending really surprised me. Even the motives behind the killing are a bit of a mystery until they are revealed at the end leaving you really guessing and what I thought was the reason ends up being totally off in the end. 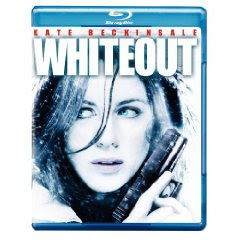 We watched Whiteout on bluray and honestly this is one movie that I'm pretty lukewarm about when it comes to if you should buy the bluray or standard version. The scenery in the movie is well, um, mostly white so it's not like your missing a ton amazing video if you choose to purchase this in standard. As well the special features are a bit ho hum but this is my personal opinion as a good amount of them have to do with what it takes to film a thriller in one of the coldest places on earth and again I'm just not a huge fan of vast amounts of snow. I'd much rather be somewhere warm. The sound effects and dialog are I'm quite positive much more impressive in the bluray version and this is a suspense thriller so there is tons of loud sound effects and gunshots of course. I still always opt to go bluray over standard version whenever possible. Whiteout is available right now and you can pick up your copy on Amazon!